"“They have persuaded some parents to hand over their children — some as young as 18 — to be shot by appointment in a nonlethal way to spare them more serious injuries,” the BBC reported." WOW. Could always try putting them on a plane so somewhere...can you imagine your parents taking you to an appointment to be shot in the leg or something? "We'll see you around 3 o' the clock then so we will. Don't be late boyo...."
Kneecapping has always been a form of discipline. There's no place to hide. If you don't take the discipline you end up dead. That's just the way it was. However, I did always find that to be a somewhat extreme form of discipline myself. The knee capping might have been disciplinary for some but a lot of that stuff was just to get money. Pay up and life will be fine. What they knee capped young people for had little if anything to do with discipline. it has to do with instilling fear and obedience. Sometimes what you read in the newspaper is about as credible as an episode of the Sons of Anarchy. Drugs and guns are two different things. Did they run guns? Of course they did. I had a friend in Twinbrook who used to smuggle rocket launchers in her stroller past the British Army back in the day. That was a long time ago. However, the IRA would shoot drug dealers dead in West Belfast. Keep in mind, the British press is somewhat biased towards the IRA. The corruption came in through extortion. 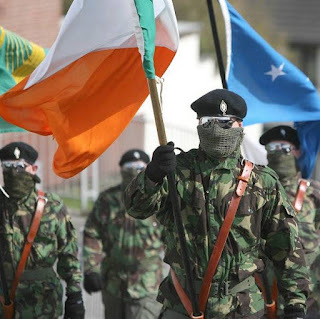 Both the Catholic and the Protestant paramilitaries would go to businesses in their area and demand protection money claiming if they did not pay they just might have an accident so to speak. It wasn't just stuff in baby strollers past the British military. It was world wide to make money for their "cause". Not all people's news comes from newspapers in G.B. Back in the 1970s they discovered a rather prominent member of the IRA living the good life in the Lions Bay area. Even then it was expensive, for the time. The arms were going into Ireland to fight the British occupation. Members of the Guinness family built the Lions Gate Bridge and lived in west van. I have no idea of their political affiliation but somehow I doubt they supported British Occupation. the guy found in Lions Bay was no member of the Guiness family, rest assured. I don't remember his name, but it wasn't Guinness. He had come into Canada on the sly. Back in the 1960s and 1970s that wasn't hard to do. I would suggest they didn't care about British occupation It was all about the money. Back then I don't think there was anyone in Ireland that didn't care about British Occupation. I'm not sure a member of the IRA living in Lion's Bay was a bad thing. I'm aware of the IRA penchant for kneecapping, but I find it hard to believe they'd be following anyone to another country far away. Probably not an option for the folks involved in this stuff though, not likely they could afford that. I don't know about now, but in the 1970s and 80s, they didn't have to follow, they had supporters in the U.S.A. and Canada who were well connected to those "back home". In certain area's they did. If the guy decided to hang out in Boston, NYC or Chicago that would be a bad thing. Seattle or Phoenix, probably a different story. In the early 80's there was an Irish bar in Chicago that had a jar on the bar for collections "for the cause". as they say, one person's freedom fighter is another person's terrorist or criminal. Yes just like Edward Snowden.